I hope everyone is having a great week so far. Mine started out with a migraine for two days then a long afternoon at the doctor with Nadia so we are definitely looking forward to a long, relaxing Labor Day weekend. If you are a book reviewer I would love for you to consider reviewing my new book Finding Joy: The Year Apart That Made Me A Better Wife. Interested? Just Click Here for more information. Hope, the creator of our #JoyHopeLive link up has written a book and it will be available September 24, 2015! Isn’t that exciting? Hope N. Griffin from Finding Joy in Everyday Be sure to follow her on Facebook and Twitter. Visit her blog for book reviews, military life, and more. She will be tweeting out your links and adding them to the pinterest board over the next week. Mary Gilbert from My Life in Progress. Be sure to follow her on Facebook, Twitter and Pinterest. Visit her blog as she shares her experiences, thoughts, life & faith with you. She will be visiting your posts and commenting. Vanessa from Tapestry Chronicles. Be sure to follow her on Facebook, Twitter, and Pinterest. Visit her blog as she shares her life, projects, and faith with you. She will be pinning your links to our pinterest board. There are so many ways we can pursue joy in our lives, but it has to come from the heart. Being momentarily happy and possessing an internal authentic joy in the face of difficult circumstances are two very different things. I believe it is the little moments of happiness that help shape and prepare us for the difficult life circumstances we all face. My question is what do you do in your everyday that brings you happiness and fosters a deep found joy in your life? Now for what you’re really here for! 1. Add a link that captures how you Find Joy in the Everyday. It can be a craft, book review, personal story, etc. Just make sure it captures joy. 2. Tweet or share on Facebook your link with #JoyHopeLive (this makes it simpler for me to give you a retweet and comment). Each week we add the posts to a pinterest board. Go love and share some pins. 3. Comment on the posts you love and the two directly before yours. 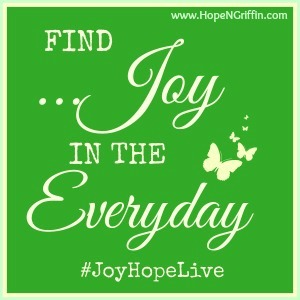 Be sure to include #JoyHopeLive when you do so they know where you found them. 4. Come back on Friday and vote for your favorites! 5. Grab the button! Share it on your sidebar or in your post so others will join us next week. By submitting a link to this party, you are giving the co-hosts permission to feature your post on their blogs and/or social media platforms and utilize your post images in order to facilitate this feature. Now you can also post your link on the pinned post on Hope’s facebook page for ease in sharing one another’s posts and getting more interaction. When you share a link on your social media be sure to add #JoyHopeLive.